We had a great time at DJ Daisy O'dell's Vinyl Lounge at Palihouse last Friday night. Derek was spinning some of his favorite tunes--many of which have been or will be featured on VINE-YL. Sara perused the wine list while enjoying first-rate martinis and the company of our friends Sam, Monika and Charles. A great night for vinyl lovers in a truly sublime venue reminiscent of French noir films by Melville or Dassin. Any of you who live in L.A. should come see us in the coming weeks. This party has all the makings of a great night out. 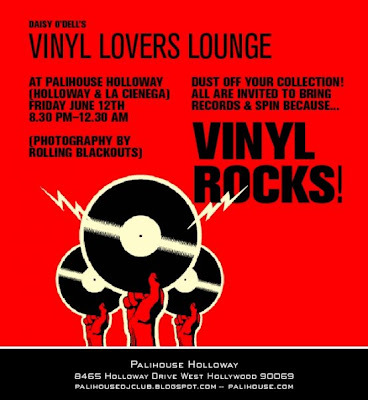 Those who love the medium of vinyl will find a new Friday night home at Palihouse. Special thanks to the illustrious organizer, Daisy O'dell (who got the night started with a fresh set of her own); DJ's Scott, Jun and Alex and gracious Palihouse manager, Bruno.